I’ve had to go to the Social Security Office a couple of times for various reasons. Each time I go, I see the Protective Service Officer (PSO) sitting at his desk. Without being told, I know that he’s there for security purposes. I had to get to know this man. One thing I’ve learned doing interviews is that not everyone is as they seem. Suffice to say, when I sat down to speak with Ernest Cole, PSO of the Social Security Administration, I knew I was right about he being an interesting person. Ernest shared with me that is married. 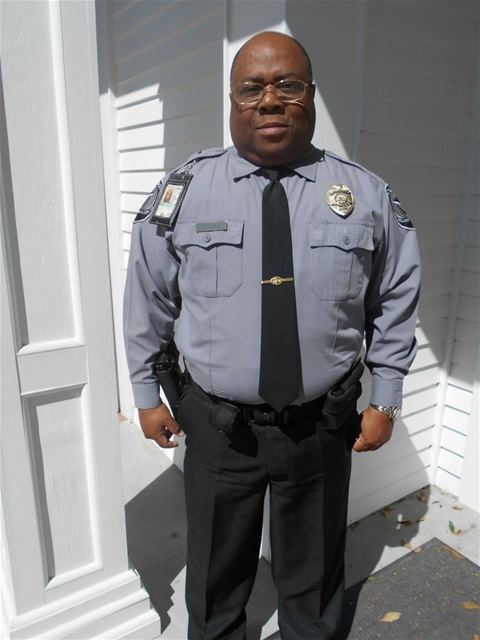 He met his wife, Celeste, in Charlotte where he was a police officer. She lived in a gated community where the school bus would have to drop off children at the gate. Since there were several buses at one time, they had to have on duty police officer there to prevent the children from fighting between themselves. “So you were a police officer? How long on the force?” I asked. Ernest shared with me that he was from Brooklyn, Crown Heights area (not the ghetto, but thee Ghet-To; the real McCoy). His father was on the police force there, as well. Obviously he set a good example for his son because he followed in his footsteps. We spoke about his influences from a police family, New York, and ghetto life to how he made his way to South Carolina. After the military, he went back to New York, but decided he needed to get away from the big city life. A friend of his, James Cole, got him on the Charlotte Police Department. Ernest did a lot of patrolling as well as Special Weapons and Tactics (SWAT) until he finally retired. He and his wife wanted to come back to her roots and raise their daughter, here in Georgetown. She wanted to return to the nice quiet hometown Celeste grew up in as opposed to the blaring lights and noisy city sounds of New York or Charlotte. Their daughter, now grown, has gone on to college and now works for the Port Authorities. Like his father before him, they used positive influences to raise their daughter. “How do you feel about gun control and the current events surrounding it?” I asked. “What is gun control?” I asked, agreeing with his take on the 2nd Amendment. We talked about how the gun ban in New York failed back in the 1970s (buy-back-guns as current events in LA are doing). The government took all of the guns, especially Uzi’s, and filled them with lead so they couldn’t work anymore. The result was the Mafia, Organized Crime Syndicates, was the one who had all of the machine guns. I know this from my own father, being affiliated with Organized Crime, actually having an Uzi in our house (we knew never to touch it). I spent an hour with him and didn’t realize how much time flew by. We talked like old friends, as he was so easy to communicate with. We laughed about how we don’t need to visit our neighbors, just go to Walmart; it seems to be the meeting place to see everyone. We even discovered we had mutual acquaintances (who knew in a small town?). As our visit came to an end and I began mulling over in my head how to write this piece, I have decided one thing: I will not end this column without discussing his experience at Food Lion in August of 2015. It truly amazed me. Even now, as I’m writing this, I’m still flabbergasted it ever happened. “They did not!” I exclaimed. “Yes, they did,” he responded laughing. “I told them because I’m an American and I’m exercising my 2nd Amendment right to bear arms. They did not ask me for my ID, instead, they kept wanting to know why I needed to carry a gun at all, so I said, ‘let me just straighten everything out right now...someone saw my gun and called the police and said that there was a black man with a gun, and you came.’ The other officer confirmed that was exactly what happened…I was racially profiled. “And did you?” I asked (seriously, I was shocked). I thought about this for several days, I thought about our right to bear arms, and I’ve thought about Hitler and how he convinced so many ignorant people to lay down their arms and give him total control. Then I thought about the Revolutionary War. King George and his military were the only ones allowed to have guns. When we migrated to America and took up arms, it stopped his tyranny. If not for our weapons, we would not be a free nation. If not for our guns, we would have never been able to overthrow Hitler and we’d all be speaking German right now. Ernest, you are so right! We need to practice putting laws into effect that we already have in place and not disarming ourselves. I am so glad I played my hunch and took the time to speak with you. You are an amazing man and I thank you for your time!